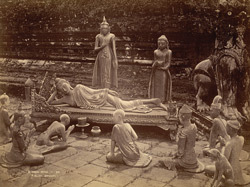 Photograph of a group of Buddhist sculptures arranged in a tableau, taken by Philip Adolphe Klier in the 1890s. The figures represent a reclining Buddha in the centre, with attendant worshippers including monks and other praying figures positioned around him. They may represent figures that play an important role in Buddhism such as the Buddha’s disciples, novices and the lokanat (a spirit possibly deriving from the Bodhisattva Avalokitesvara). Burmese Buddha images are traditionally cast in bronze but these kinds of free-standing figures are often carved in wood and found in religious sites such as pagoda platforms. The Burmese have an ancient tradition of woodcarving and the animated and naturalistic quality of the figures is a product of the technical and aesthetical skill of Burmese artisans.